These health-related metaphors have become so ubiquitous that they can slip past our notice. Metaphor has been recognized as one of the most important rhetorical devices of all time, ever since Aristotle treated it in his Art of rhetoric. Metaphors are as sophisticated as language use gets. And it’s possible you have not thought about metaphors since you were in high school English class. Which is a shame, because metaphorical language is commonly used to communicate about health. 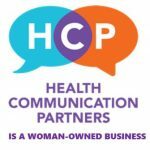 Metaphors can enhance communication with patients. 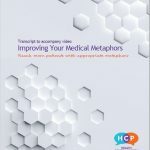 Physicians who use more metaphors receive higher rating in their communication skills on multiple measures. Here’s the problem: metaphors can fail to have their desired effect. What’s more, they sometimes have negative effects. So right here, I’m going to give you a quick overview, and a deep dive, so you can start improving your medical metaphors. You know that a metaphor (and simile, and analogy) is a comparison between two things: what’s relatively familiar, and what’s abstract or less well known. In research terms, the two halves of the metaphor are called the tenor (or source) and the vehicle (or target). The tenor, in your case, is the medical phenomena. The vehicle is what you are borrowing the traits from. The common, everyday item or event. This is where it gets tricky. Your metaphor hinges on something you assume is common between you and your patient. But what counts as “common” is local to communities and social groups. What is normal, natural, or everyday, varies by someone’s race, class, gender, and more. Wanting one standardized metaphor for everyone is like wanting one joke that makes everyone laugh equally. Physicians I’ve spoken with about metaphors have repeatedly commented about how hard it is to be aware of our language. And you’ve heard me say this before. It’s true, in part because language is so complex. We also tend to take it for granted. And when it comes to the significance or meaning of a term, well that’s slippery too. Because meaning doesn’t come all ready-packaged in a word. We build meanings as we process language. That is to say, we make sense of things while we speak, read, write and listen. You’re not just trying to help a patient understand something. You’re trying to convince them to see it in a specific way. You are framing. This is powerful language use. If you want to be helpful and instructive with your metaphor, it’s worth taking a close look. This may be especially important (and harder to do) when it comes to metaphors that have become entrenched in your specialization. This is about building critical awareness about your use of metaphor. It can be difficult to step back and notice what we’re taking for granted–but that’s what we’re doing here. A 1-hour on-demand workshop that will help you get the most out of the metaphors you use. This workshop goes beyond the benefits and challenges of using metaphors. It shows what you can do about them. The result is an intense 1 hour experience where you break down your metaphor, find out how it works, and develop a process that will help you reach any patient. It’s loaded with research – from across specializations. Examples guide you through the process of breaking down and improving your own metaphors. It’s also in bite-sized pieces. 5 separate video lessons, all around the 10-12 minute mark, that you can take when it’s convenient for you. Right here on this site. And you can watch from any device. I don’t mess around. It’s video, I narrate it, there’s research references. I’m proud of it because I know it will change the way you think about metaphors. I promise you have not seen anything like it. And if you give it a try for 30 days and it just isn’t helping? Let me know and I’ll give you a refund. IMPROVE THE METAPHORS YOU USE. REACH MORE PATIENTS. Learn to evaluate metaphor effectiveness in this 1 hour, on-demand video workshop. Differentiate between parts of a metaphor. Identify cognitive & affective aspects of metaphor construction & reception.